Ship in 2 to 3 Days! Our Kids Science Lab Coats are authentic Scientist Coats made from a durable Cotton and Polyester blend that will stand up to numerous machine washes. Add personalized embroidery to any Kids Science Lab Coat or Scientist Scrub Cap and make it a special gift to remember for many years to come. Real Scientist Coat in a size for the littlest Scientist! 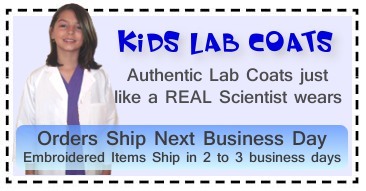 There is nothing like having a real Kids Science Lab Coat! Real, White Science Coat for your little Scientist! Copyright © 2018 Kids Science Lab Coats. All Rights Reserved.